First impressions are everything. And your home entryway or foyer is no different. It gives visitors a peek into your personality and design aesthetic; even if you think you didn't have the latter. If you have a small entryway like me, then the options you have to display your style is even more limited. But that doesn't mean to ignore this space or dress it in a way that screams "after thought". It's important to set the right tone and leave a lasting impression on your guests. When your foyer is small, there are a number of things you can do to make the space your own and wow your guests. Let's take a look at 6 essential elements for decorating a small entryway. 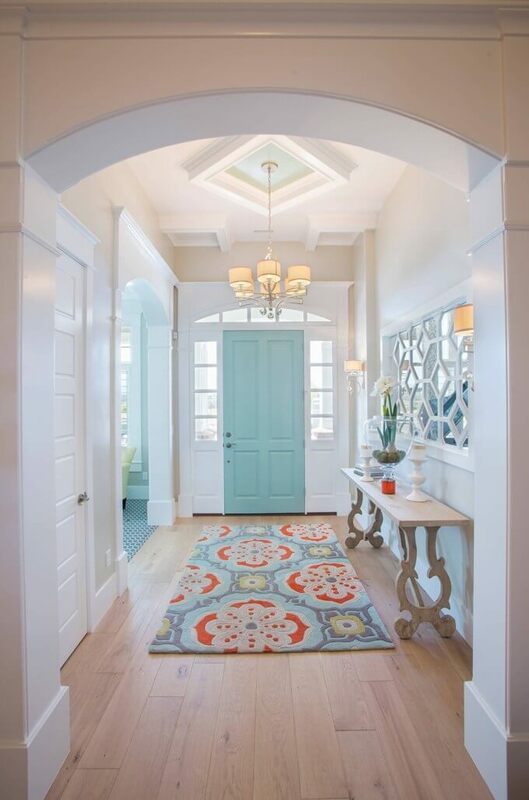 A rug should be used to ground the space and assist with designing the look for the entryway. A rug is also great with minimizing dirt from entering the home. If your entryway can accommodate it; add seating. This is advantageous for those that have little ones that need a place to put on their shoes before heading out the door. Or it can be used as a comfy resting spot to kick off your shoes and open the mail. Either way, the addition of a seat makes the space feel inviting. Mirrors serve a two fold purpose. They can make a small space feel larger and they can be used to reflect artwork or pictures along the opposite wall. Using a mirror in the picture above is especially great with narrow hallways. A table acts as a landing space; a place to "land" your car keys, mail, and purse. 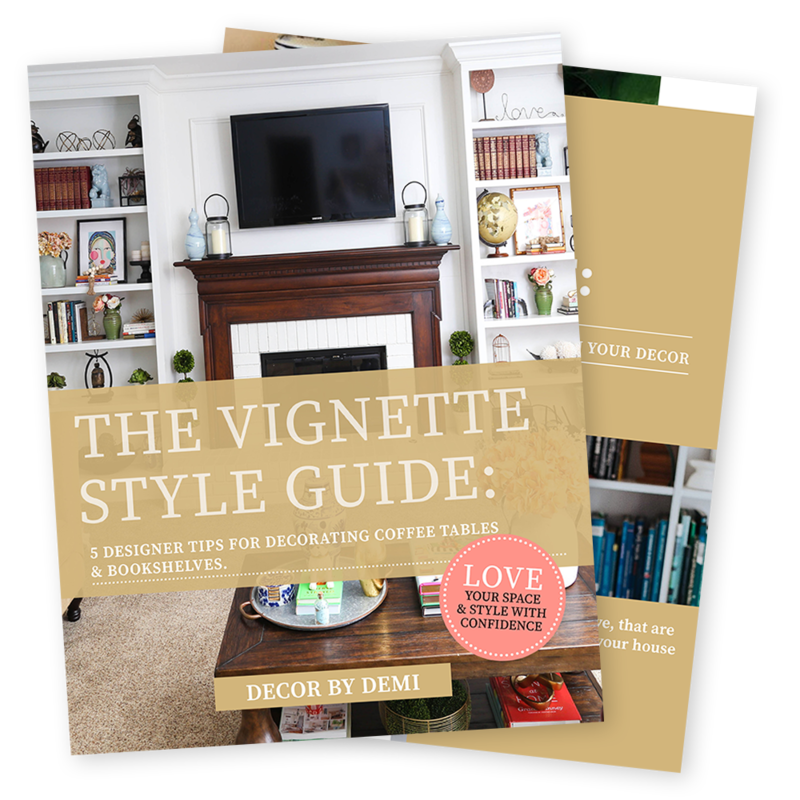 Along with being a landing space, a table is great for displaying decor and storing things out of the way. The wicker baskets used in the picture are a great example of both an accessory and storage. I also love how the cluster of pictures above help to define the wall and space. If you're short on space for a table, use your wall for extra storage. Hang wall hooks for hats, totes and jackets. Its also a great option for keeping things off the floor. There's nothing worse than walking into a home that's dark. Sufficient lighting is especially important in a small entryway. When you open the door, you really want to be able to see the space and discover the home's personality. If table lamps aren't an option like the picture above, wall sconces are a nice alternative. 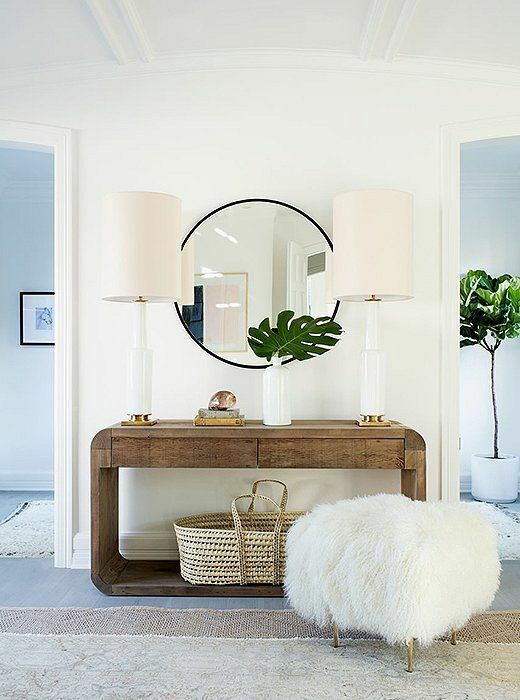 With these 6 essential elements, you can't go wrong with decorating your small entryway while impressing your friends. Being small doesn't mean you can't make an impact! Are you struggling with creating a look for your entryway? If so, check out my Design Launch Consultation package here to get started.